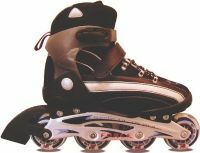 Suitable for sporting and recreational In-line skating. Black with silver grey detailing. Safety first, we recommend supervised use and the wearing of safety protection such as a helmet and safety pads. Reduced from £49.99 to todays price of £29.95 for a limited time.